Like any major building project, metal roofing systems must be installed perfectly in order to work great and last a long time. It is important to do your due diligence when it comes to both the metal roofing materials you are going to choose and the professional team you’re going to trust to install the materials on you home. As you’re conducting your research, it is important to look at some of their previous work as well as what their customers had to say after working with them. If you find bad reviews and photos (or worse, no reviews or photos) that’s a major red flag. In that case, it’s time to find a different company to work with. Check whether the company and their workers are properly insured and licensed to be doing the work they’re doing. Lastly, you’ll want to make sure the crew that you’ve investigated is the same crew that’s going to be working on your home. We’ve created a helpful checklist to help you navigate this process. Since metal roofing materials are very lightweight, most of the time they can be installed right on top of your existing traditional roof. Even metal shake and tile profiles, which are more substantial, can be installed over the top of wood shingles or shakes. You want to make sure you work with a contractor that has experience installing metal roofing materials on top of an existing roof, since there are many factors that must be considered. In certain cases, building codes prohibiting more than two layers of roofing can be waived for metal roofing applications. An experienced professional will know how to properly navigate these regulations. The condition of the structure and roof decking also needs to be adequately evaluated before installation can begin. 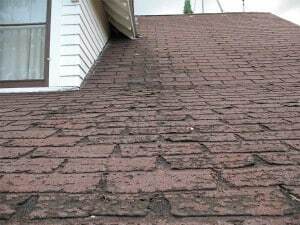 In certain situations, especially when working with existing wood shingles or shakes, the material along the edge perimeter (and sometimes even the lumber) should be removed and replaced before installing the new metal roofing. If you have a slate or asbestos state roof that you’d like to cover, it might be possible to install your new metal roof directly on top of it, but an experienced professional must be consulted to ensure safety.